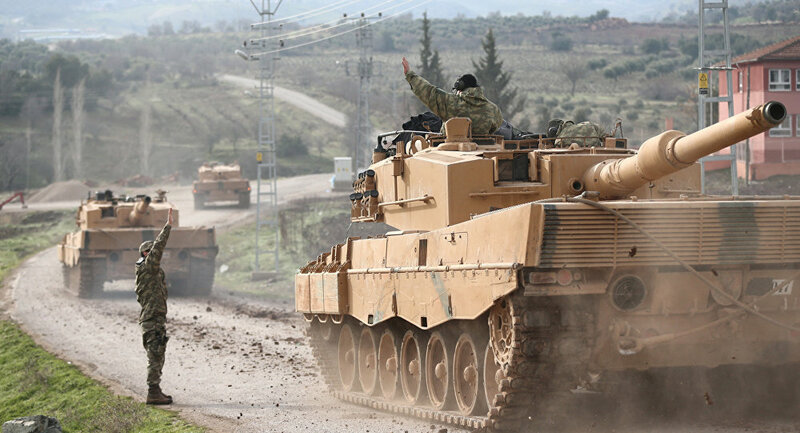 The statement was made amid an enraged Turkey's military operation in the Kurdish-populated Syrian city of Afrin, dubbed Olive Branch, which was launched on January 20 with airstrikes in the area, and moving on to ground operations, which began on January 21. In his Sunday statement, Turkish President Recep Tayyip Erdogan has blamed the United States for supporting the Kurdish militia in Syria, saying that the US has sent 5,000 trucks with weapons to the Syrian Kurds. The president urged Washington not to provoke Ankara, underlining that "this is our people's struggle". Speaking about the recently tense relations between Moscow and Washington, Russian Foreign Minister Sergey Lavrov stressed that a set of "non-paper" proposals on cooperation that was given by Russia to the United States is still in place. "The proposals are always in effect. We never 'strike a pose,' but try to understand the background of the activities carried out either by the US side, or by our other colleagues," Lavrov said, answering a question if these proposals still remained in place. The minister noted that in US-Russia relations, there were currently a number of issues stipulating the aggressive stance of the US establishment on Moscow. The statement was made in spring 2017, when US Secretary of State Rex Tillerson declared after talks in Moscow that the Russian side had given the United States a set of proposals on cooperation. As Russian Deputy Foreign Minister Sergey Ryabkov specified, Moscow had given Washington the list of proposals in a "non-paper" format on issues such as cybersecurity and the struggle against intellectual property infringement. Lavrov went on by saying that certain representatives of the US Congress admit that the current situation in Washington's relations with Moscow is far from normality. "We are encouraged by the situation that recently several members of the US Congress, the representatives of US political science, diplomacy have admitted off the record that the situation [between the United States and Russia] is abnormal and it should be corrected," Lavrov said. The diplomat added that, at the same time, those people understand the US actions towards Russia as excessive, proposing Moscow to make some steps to allow them to say that Russia had "eased up." According to the minister, such mentality does not serve US interests either. The top diplomat pointed to the growing military buildup across the world, comparing the situation with the Cold War-era. "In the absence of ideological differences, a buildup of military capacities is unfolding. We have not seen such developments since the cold war," Lavrov said. In his interview, Sergei Lavrov denounced the "sponsored" campaign that was launched against Moscow, which, according to him, impacted the participation of Russia's athletes in the Olympic Games. "There are numerous facts showing that apart from real cases of doping use by our athletes, as well as by athletes from other states… there is an absolutely sponsored campaign based on a principle that is also being used in other spheres of international life when it comes to contacts with Russia and its partners," Lavrov said. The minister went on to speak about the provisions of the report of Richard McLaren, head of the World Anti-Doping Agency investigative team. "If I am not mistaken, Richard McLaren in his report said that there was no evidence, they do not know, how [the use of doping] had been carryied out, but they know how it could be carried out. No court in any country would recognize such accusations as reasonable. However, taking into account such rather exotic statements, the decisions to deprive the country of the Olympics are made," the diplomat added. According to the diplomat, the existing situation in the world is characterized by an unprecedented wave of Russophobia, a level that was not even registered during the Cold War, when relations between the Soviet Union and the United States were characterized by ideological rivalry. The statement is connected with the disgrace, sparked by WADA informant and former head of the Moscow Anti-Doping Laboratory Grigory Rodchenkov's doping accusations against the Russian sports, which triggered a massive scandal and sanctions against Russian athletes. The punitive measures include the deprivation of medals won at the 2014 Sochi Olympics and banning the Russian national team from the 2018 Winter Games in South Korea. Commenting on the issue, President Vladimir Putin denied the existence of a state-run doping program, but admitted that sports at the national level faces some problems with doping that were being tackled. Lavrov further touched upon the abrasive relationship between the United States and North Korea. "I think that it is unacceptable [to violate international accords] either on Iran… or on the Korean Peninsula, where we also head an agreement reached in 2005 that had clearly defined the requirements imposed on North Korea and on others… In a couple of weeks after everything had been defined, the US side suddenly found out about an old case with a certain bank account in Macau and started blocking North Korean accounts… There was an accord that said 'Stop' to the confrontation and the provocative actions. It failed," Lavrov said. According to Lavrov, it is possible to argue on the issue, who had the point in the situation, but the accords were violated and the capacity to reach agreements was one of the most important issues nowadays. The statement was made in wake of Trump's January 18 accusations against Russia, which he voiced in an interview with Reuters. As the US president explained his stance, Moscow was "not helping us at all with North Korea," accusing Russia of "denting" what had been achieved by China through introducing harsh economic sanctions against Pyongyang. According to Trump, Russia is allegedly helping North Korea by supplying the country with fuel in violation of international sanctions. The president emphasized that the United States was increasing its missile defense and offensive capabilities, as despite his hopes that the tensions between Washington and Pyongyang could beresolved in a peaceful manner, "it's very possible that it can't."